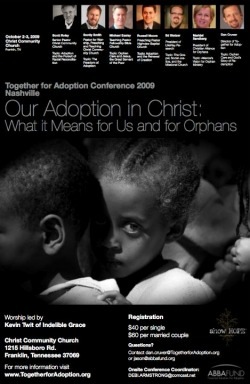 The Together for Adoption conference in early October is appealing for help to pull together a free e-book that will be released before the conference starts. If you think you might be able to help please contact dan.cruver@togetherforadoption.org or jason@abbafund.org for information about volunteer opportunities. This would give you the opportunity to help mobilize Christians for orphan care. This appeal was read at the Take Your Vitamin blog.